One of the beautiful islands of the Ionian sea, Lefkada has the added advantage of being easily accessible through a small draw bridge. Lefkada belongs to the province of Eptanisa (or Heptanese = seven islands) in western Greece. Despite its small size, I was surprised to find out that the island landscape is laced with much variety which made our visit a delight. The small town of Lefkada appeared soon after we crossed the drawbridge, and we drove easily through it on our way to a beach named Kathisma. Within minutes we found ourselves climbing a winding narrow road that took us on top of a hill overlooking the whole valley and the town below. The scenery from there is spectacular and I took the opportunity to shoot some good photographs. We continued our drive on the narrow island road through small towns, olive groves, and endless hills until we reached Kathisma beach which we had read was among the best beaches in Greece. It took much longer to get there than what the map seemed to imply and our little girls were anxious to hit the beach. Parking right on the beach road was no problem, and within minutes we were splashing in the cool Ionian waters. Kathisma beach is a very nice beach full of life. It is well organized with ample parking, restaurants and kiosks within easy reach. It is also full of youthful beach activities like volleyball and tennis courts, and parasailing and hand gliding from the steep hill above. It is also a large beach that did not feel overcrowded despite the multitude of people who were there. My sister Vivi and her husband George had joined us for the trip, and their young son with our little girls got to play in the sand all day, as we relaxed under the hot sun and watched the people and the paragliders who flew over the beach. 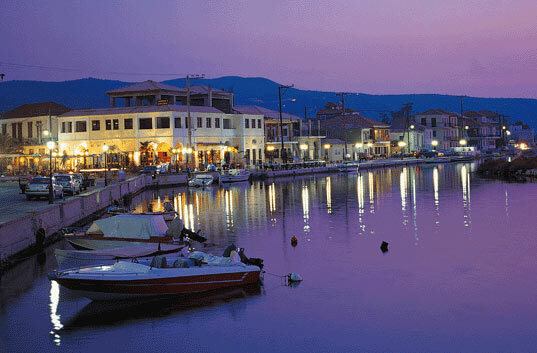 Our drive back towards Preveza took us through the town of Lefkada again, and we stopped to have dinner. It is a small town with Italian architectural character and a lively street life. As the sun dipped bellow the horizon, people of all ages and ethnicity came out for a slow stroll through the narrow streets and to have a quiet dinner with friends. The town square where we sat for dinner became the center of life with a magical flare as small street vendors setup shop and demonstrated their goods for all who passed by. Balloons, windmills, jewelry, plastic jumping spiders, cotton candy, young and old tourists, children on bicycles and on running feet, tourists and locals, all assembled there in the little square to paint a picture of life and happiness. It was the perfect end to a nice day at the island. Our trip from Arta to Lefkada island had also a visit to Porto-Katsiki beach scheduled but we found it impossible to fit both beaches in the same one-day trip. Mostly due to the fact that in order to get to Lefkada going south from anywhere in Epirus, you must cross from Preveza to Aktion by ferry. Although ferries run at a regular pace of every 45 minutes or so, it is a major bottleneck and we found ourselves waiting in the scolding sun for over an hour before we boarded the ferry for the 20 minute trip across. By summer 2002, the undersea tunnel will be ready, and it should make the trip much easier and faster. The ferry cost us 1100 drachma, or about 3€ ( Currency Converter) for a car and its passengers. UPDATE: In the summer of 2002 we visited Lefkada once again, but this time we were spared the ferry trip because the undersea tunnel is ready. We followed the signs to the tunnel and soon after we passed the town of Preveza, we slid under the sea for the short drive (5-10 minutes) across to Aktio. Our little girls were very disappointed to find that the tunnel had no windows to watch the underwater life, something that we hope future underwater tunnel designers will fit into their plans. We happily paid the 3€ toll upon our exit from the tunnel. We did return within a week to the island of Lefkada though, this time determined to reach Porto-Katsiki beach that was voted as one of the best in Greece (it was number two behind Myrtos Beach in Kefalonia). Once again we took the same road from the town of Lefkada going south through many hills, and we passed the Kathisma beach following the map towards the southern end of the island. We found ourselves on a very narrow road that continued on a steep incline for what seemed to be an eternity. In fact I began wandering if we would ever find the other side of the tall mountain we were climbing, and whether or not we would ever reach Porto-Katsiki within the day! The southern end of the island is more sparsely populated than the north, and since I was running low on gas I really began worrying about getting stuck in this high altitude. In fact, there is not a single gas station in west side of the island after Kathisma until one reaches Vasiliki, and to reach Vasiliki from Porto-Katsiki one must drive back north to Komili! The trip was becoming an adventure that I had not planned for, and things got even worst as we passed Athanio because my gas gage seemed to dip well below the red "E" and the road became narrower to the point where it barely fit our little car by itself in many places, and it often seemed to disappear into a steep cliff. Even though I fancy myself a skilled driver my palms were sweating every time I found my car precariously squeezing between the road gaps which were swallowed by a 100 meter cliff below and the oncoming traffic on the other side, all within a space that seemed barely enough for one car. We did manage to reach Porto-Katsiki on fumes and I was very surprised to see what seemed like a million cars parked on hastily plowed parking lots. The scenery at Porto-Katsiki is truly spectacular. The beach is carved out of the soft limestone mountain, and it is framed by huge vertical cliffs that seem to hang ominously above the fragile white beach and the turquoise water. The only way to reach the sand is through the very steep and narrow concrete steps that the locals have cast upon the cliff. We could not help but marvel at the beauty of the scenery as we sat under the shade on one of the restaurants to have lunch. The descent to the beach through the narrow steps was rough with our little girls (aged 5 and 2) and all our beach gear, and we had a hard time finding a place to set our umbrellas in the narrow strip of white sand that was literally packed with bathers. We had a nice day at the beach, but we learned a few things from our visit: Porto-Katsiki is still a wild place and one of the best looking beaches in Greece, but it has been discovered by too many people. It is not the best place to be with small children (since there are no bathrooms anywhere in the area, and the densely populated beach does not allow for free play,) and it is definitely not a good beach to visit during the month of August when the entire country of Greece is on vacation. We loved Porto-Katsiki for its raw beauty and we will return to it, but next time we will make sure that we visit during an "off" month (like May, June, or September.) Next time we will have a full tank of gas, and we will make sure that everyone has been fed and visited a restroom before we reach the beach. Porto Katsiki is justly included among the best beaches of Greece. The east coast of lefkada is much more developed than the rest of the island. The efects of packaged tourism have transformed Nydri to a busy port that has lost all its character when it transformed itself to the generic tourist town it is today. Nydri is the base for many small boats that offer daily cruises around the island. Amazingly enough there are no good beaches to swim near Nidri. Asking around we found Desimi and Mikros Gialos a few kilometers south, but these beaches are nothing to write home about compared with the beaches of western Lefkas. The road on the east coast is much better than the west coast, so if you are heading south this is the fastest route to take.